Samurai Sword Umbrella | Nerd Much? 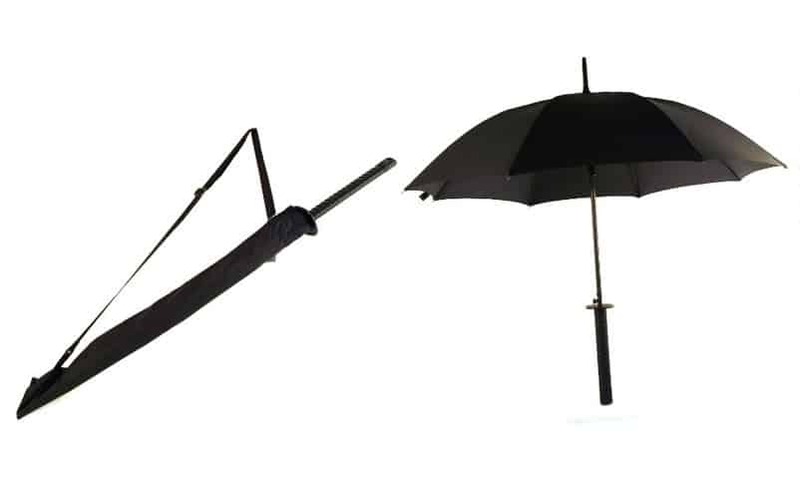 Prepare to slay your enemies while simultaneously shielding yourself from the rain with the Samurai Sword Katana Umbrella. It’s a fully functioning nylon umbrella, with the handle having the look at texture of a samurai sword. The samurai umbrella also has a nylon cover that looks like a sheath. The cover has a carrying strap for you to throw over your shoulder, placing the katana umbrella on your back at the ready. You know, in case you need to cut through some rain. This is a much more subtle way to nerd out while using an umbrella, as opposed to the lightsaber umbrella we posted about last week. But, it’s just as fun to pretend you’re using a ninja’s sword as it is to pretend you’re using a lightsaber, we suppose. Maybe not. Lightsabers are cooler. Still, if you’re looking for a subtle way to nerd-out daily, this is your choice. Stay tuned to Nerd Much for more cool stuff to buy that you probably don’t need.